Coconut milk is a staple in my pantry because I often use it for Thai inspired dishes and baking. This time around, I used a can of coconut milk in place of milk often used to make hot chocolate. I got some inspiration online from a few websites but in the end, decided to just wing it to make my coconut hot chocolate. It's an easy variation that's not too sweet but has all the luxurious flavor and texture of the richest hot chocolate I've ever had. Even better is that this version is completely vegan! In a 2 quart saucepan over medium heat, add the entire can of coconut milk. Fill the empty can with water and add this to the pot as well. Add the honey, sugar and cocoa, stirring to dissolve. Allow to warm but do not boil. Serve warm. What a great idea! I love the combo of coconut and chocolate. I also like orange/chocolate and raspberry/chocolate. You've got me thinking now! Wow, awesome idea! I am going to try this! I've had a can of coconut milk in the pantry forever. My husband doesn't care for Thai food or curries so this will be a perfect way to use it. Thanks! Oh wow! That looks so creamy and beats my basic hot chocolate any day! 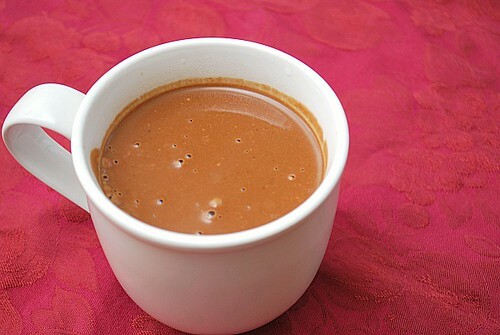 it never occured to me to use something as flavourful as coconut milk for hot chocolate. this sounds divine. Will have to try this soon.